Wearing his trademark Wild Card Boxing t-shirt, only this time emblazoned with the Union Jack, Freddie Roach looked every inch a member of Team Fury as he chatted openly about his new marriage of convenience with the Gypsy King. When Tyson Fury's heavyweight showdown with WBC champion Deontay Wilder was formally announced at the BT Sport studios in Stratford, on 1 October, Roach had nothing to do with the promotion whatsoever. In fact, the 58-year-old had only ever seen the Wilmslow traveller fight once. But he has emerged as an unlikely protagonist during a fight week which exploded into life at Wednesday's final press conference here in downtown LA when Wilder took umbrage to Fury's suggestion that he is not from fighting stock like him. Roach has seen all of this before during his Hall of Fame career as a trainer to some of the most iconic fighters of the generation. Even so, Fury, without question, is one of the more colourful characters to have walked through the doors of his fabled Wild Card gym in west Hollywood. Initially, the 6ft 9in undefeated traveller only wanted to have a look around before heading up the hill to Big Bear where his camp would begin in earnest. “The first time he came in the gym,” Roach says. “He just called up because he wanted to visit the Wild Card. “He then went up to Big Bear which I thought was a bad idea because he's fighting at sea level and up there the oxygen is very thin. He called me up about four days later and said: 'Freddie, can I come back to your gym?' I said 'yeah, sure'. “He came back and he asked me how much I was going to charge him. I said 'you're the heavyweight champion of the world, I don't charge the heavyweight champion of the world to work out at my gym'.” From there, the relationship blossomed quickly and within 24 hours, and a steak dinner at the popular local nightspot Musso and Frank, the decision was made to bring Roach on board as a cut man, with Ben Davison retaining his place as head trainer. “On the second night he took me out for dinner – a steak – and he asked if I would work his corner,” Roach recalls. “I said 'yeah, sure, me and Ben can work together on that no problem'. 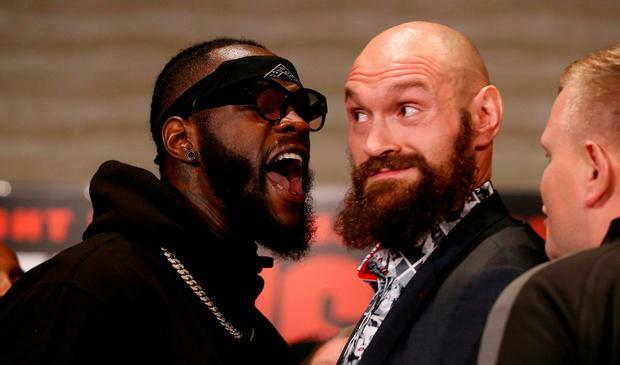 There is a feeling that Fury's boxing ability is badly under-rated in certain circles in America and even inside Wilder's camp as they attempt to inflict a first defeat on the former WBO, WBA and IBF heavyweight champion. Roach, too, was surprised by Fury's fleet of foot, ring intelligence and especially power, even going as far as describing the Englishman as 'the puncher' in his fight with arguably the most explosive man in the sport. “I haven't watched him a lot,” Roach admitted of Fury. “I had heard a bit about him but I had only seen one of his fights. “Once he started coming to the gym I watched more and more of him and he's a very, very clever guy. “I didn't say yes or no so it might still be in his mind so he might go for it. If he goes for it I'm happy because it makes for excitement. “I can tell you he's in great shape right now. He boxed 12 rounds, three times in the gym with three different sparring partners who did four rounds each. He looked great, did very well. “Talent wise and footwork wise, I haven't seen too many guys who are better than him in my time. He's boxing 12 rounds in the gym without barely breathing and he's only coming off two tune-up fights. One thing, however, that Roach was unsure about when it came to Fury, was his gypsy heritage. “I asked him,” Roach begins. “I said 'what is a gypsy?' He just said 'a gypsy is someone who has to fight every day of his life' and that he'd been fighting since he was two years old. “I didn't really know what to expect because we don't have a lot of gypsies in America that I know of. “I was wondering really – 'what is a gypsy?' It seems like gypsies have a bad reputation sometimes. That's what I've heard so I didn't know what to expect from this guy. “But when I met him, he was a really nice guy, one of the nicest guys I've ever met in my life. He is very cordial. I think he's great. He's like one of my best friends already. I like being with him. I wish I had met him earlier. First, the unlikely menage-a-trois of Fury, Roach and Davison must somehow overcome a 40-0 knockout artist who seems well and truly on the warpath following Wednesday's fiery final press conference. Fury ended up shirtless after an on-stage melee while Wilder seemed to totally lose his cool, even unloading a tirade on a reporter during an interview later than interview. But all of that, according to Roach, will work in Fury's favour. “He's getting under Wilder's skin,” Roach said. “He definitely rattled him, more verbally than anything. I expect this guy to come out firing and that works for us because our counter is to fire back. Tyson is quick and he will catch Wilder. “I think Wilder is going to come and try to kill him and if Wilder walks into that one-two he's dead. This could be an early one. “What I will say though is that anyone who underestimates Tyson Fury is a fool. “And you know what? I've had two guys in Wilder's training camp giving me reports from there – and he's not ready for this fight.